We are using this tote as a giveaway promotional item. We are putting 2 custom wine glasses in each department as well with our logo on it that matches the tote bag. This was a great way to get people talking about our wine at the city's annual wine tasting event. We will be using this business tactic again. Custom earth promos came thru for us for sure. Love these bags! The bottle divider is sewn in, protecting contents from damage which is huge. Thanks CEP! This is such an effective promotional tool. Our customers love it and so do we! Great bag. I have placed 2 orders and have not been disappointed. Such a quality product! There were a knockout at our latest conference! One of our most popular promotional items! We're so excited with how our bags turned out! Thank you so much CEP! I have noticed that the reusable wine tote has become the trend in the industry so we decided to hop on the wagon. I designed a custom bag with there staff and I am very satisfied with the outcome. Our customers who are members to our club love the bag and take it wherever they consume wine byob's, parties, family dinners etc. I recommend this to all who make wine. I have noticed using reusable bags has become the new "it" thing. It's great it shows that some people actually care about our planet, I too started using them and I use custom earth promos for all of them. I suggest using them they make a super nice bag at a very affordable price. I prefer non woven poly material over the neo prene. The feel and the green factor of the material matter to my company. Custom earth promos sent us a couple samples from the reusable totes we were interested in, we selected this one because of the construction and the print quality was good. Our reusable tote came out spot on to the sample we received. Thanks custom earth promos! I love buying things from custom earth promos. They are eco-sheek and my customers always love them up. Functional wine bags that I highly recommend. The black bag is sharp looking, our print looks crisp and professional on it. WT12 is a great promotional product for our winery. These bags were an inexpensive way to thank our customers and gain some exposure. Most importantly we can be eco-friendly in our purchasing. These recycled wine bags helped us to make the transition from plastic bags to a recyclable bag. Going green has been satisfying and great for our company. I will be a repeat customer. The graphic print area is a perfect size on this wine tote. I was worried about that but it looks fine, we are content with the out come of our reusable totes. Our customers seem to like the bag and that's what matters to me. I use this for all my liquor stores, it is a lot easier to handle bottles when they are packaged in a polypropylene bag vs. a thin plastic bag. The divider is strong and wont rip even if you just carry one bottle at a time in this wine tote. My store constantly bags 1 bottle in this tote all the time and it is sturdy with one bottle. We customized this bag for our company. It was an easier process then I thought, the staff they have will help you with all your questions. I was satisfied with our reusable totes. Our company was pleased with this company and there performance and product. The current dimensions of this bag fit 2 typical 750 ML bottles of wine comfortably with the divider. I had ordered both colors 6 months ago, this time I am just ordering the black bag. It wears better and dirt is not visible. When clients take a tour through the vineyard it can get dirty. The bag is cleanable but we just prefer the black bag for that reason. 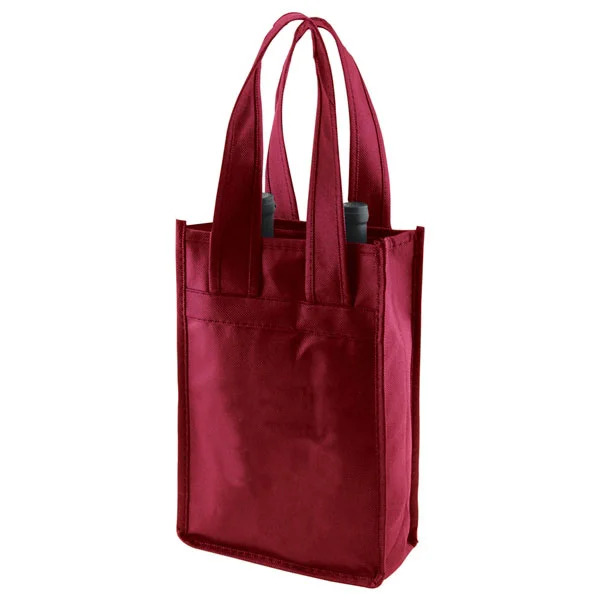 The modern, streamlined design and functionality of these popular custom wine bags continues to make them a favorite promotional gift of hotels, wineries, resorts, restaurants and other businesses in the hospitality industry and beyond. Perfect as giveaway items at conventions, expos and any other business function, the value of these 2-Bottle Recycled Wine Bags increases exponentially the moment we imprint your logo with a slogan or customized messaging on them. 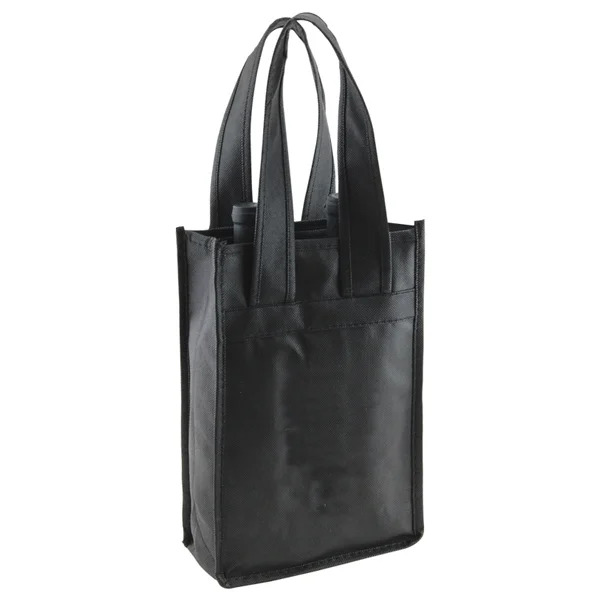 Now you can reach an potentially limitless audience, based on how many totes you distribute. And while you get so much from your investment in these safe, recyclable products, the environment benefits at the same time. 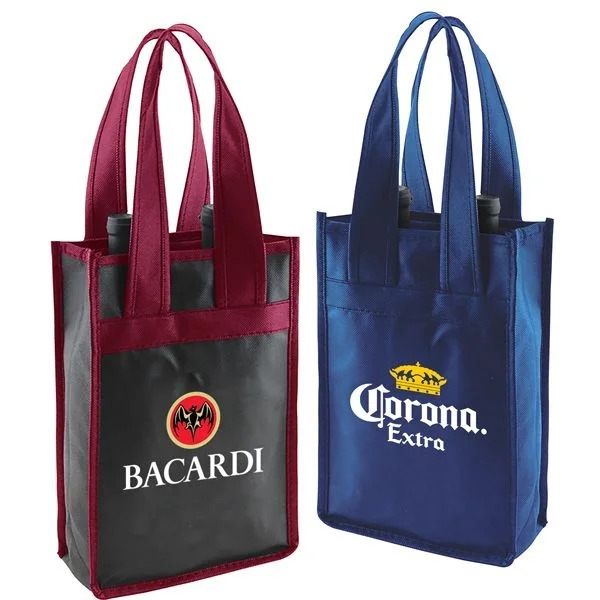 With its new 2-Bottle Recycled Wine Bag Collection, Custom Earth Promos is again raising the bar and redefining the standard for what a promotional tote can be. Innovative and stylish, these wine bags offer an ample imprint area of 4" W x 4" H to squarely place your brand name and logo in the spotlight wherever it goes. 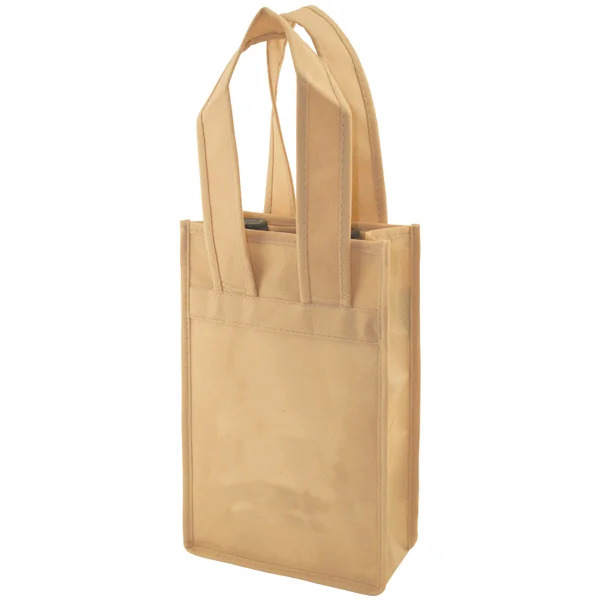 Manufactured with 20% recycled material, these bags are completely reusable and recyclable, so choosing them is a responsible and eco-friendly way to keep your brand top of mind with both your existing and future customers. The 2-Bottle Recycled Wine Bags from Custom Earth Promos are available in Black, Burgundy, Merlot, Natural & Navy, but you can opt to have your wholesale order produced in your favorite color, or even a combination of several colors. We invite you to work with our design team as closely as you like. Our goal is to help you maximize positive brand exposure by creating a one-of-a-kind imprint design that will make both new and existing customers really take notice. We are known in the industry for our highly professional work and superior customer service. and we strictly adhere to safety standards, ensuring that all of our products comply with California's Proposition 65 guidelines. That compliance requires extensive testing and confirmation that all products are free of hazardous pollutants such as lead, chromium and cadmium. Custom Earth Promos offers you the option to order direct overseas for a fully customized wholesale order of reusable wine bags that are unique to your brand. Our overseas production facility meticulously creates your order according to your specific requirements and preferences. This includes your choice of end-to-end printing, additional pockets, insulated interiors, adjusted dimensions and increased material density. You can also choose to match your bags’ fabric color with that of your brand logo and overall design scheme. Custom trimming and accenting are also available, all for free. You can expect your order to be shipped in about 8 to 12 weeks.